Do you love cakes? We all do. Paro loves cakes too. This time I involved her in the cake making process and used homemade hide and seek biscuits to create a baked beauty that Paro sweetie loved. In fact, the batter itself was too yummy that Paro and I couldn't resist licking the bowl. 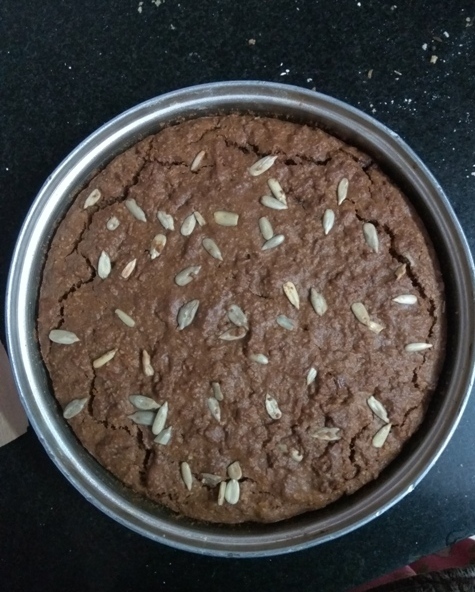 While my 2-year-old Paro was excited to make a cake, she loved the baked dark beauty that used homemade multigrain hide and seek. It was a soft, crumbly, and moist cake that used no oil. But feel free to add 1-2 tbsp of oil to prevent it from crumbling or keep it in the refrigerator and cut it only when the cake has completely cooled down. But the biscuit cake was too yummy and Paro loved it like anything. Perhaps she was excited that she had "made" the cake, so she thoroughly enjoyed it. Grind 20-25 biscuits to make 1 cup of cookie powder. Mash banana and run it in the processor along with milk and jaggery powder. You can add 1/4 tsp of cinnamon powder. Run the processor until the wet ingredients are fully blended. Pour into a bowl and stir in hide and seek powder until everything looks well combined. It should be an idly like batter. If it looks thick, add little more milk. Before baking, add 1/2 tsp baking soda and fold the batter before pouring into a greased cake tin. I preheated my airfryer to 170 degrees for 10mts and then baked/airfried for 30-35 mins. Check with a skewer if done. If not, bake for a little longer. Allow the cake to cool down completely before slicing it off. Paro was in a hurry to savor her cake, so we had to cut it when it was still hot. I even tried to keep it in the refrigerator, but darling Paro was not willing to wait. She opened the fridge and started looking for the cake, and I did not want to end her excitement by keeping her waiting for long. Nevertheless, the biscuit cake was really yummy. In fact, the cake batter (sans b.soda) was too irresistible. You may choose to steam the biscuit cake. Follow my previous steamed biscuit cake recipe to learn how to steam the cake.